October 31, 2018, ©. Leeham Co: Airbus announced 3Q 2018 results today. The company is wrestling with delivery problems for several of its aircraft programs. Its inventory of finished aircraft which can’t be delivered has increased by €5bn as a result. On the positive side is a smooth running A350 program and that the A220 program, which is consolidated into Airbus for the first time, seems void of unpleasant surprises. Airbus’ (the new name for Airbus group) revenue for the first nine months was €40.4bn (€38.0bn 3Q2017) with profit at €2.7bn (€1.2bn). Free Cash Flow and Cash were affected by the increase in finished aircraft inventory, -€4.2bn (-€3.3bn). The dominant Commercial Aircraft division (76% of revenue and 90% of profits) has a weak order intake besides the delivery problems, with orders for only 256 aircraft during the first nine months. The Helicopter division is flat in a difficult market whereas Defense and Space are slightly positive (revenue up 11% at €2.4bn, profits €97m (€57m)). Guidance for 2018 for Commercial Aircraft was adjusted to 800 aircraft deliveries including 18 A220 (before more than 800 excluding A220). The group maintains profits of around €5bn, which includes a lower negative effect of including the A220 than previously estimated. Airbus estimates 18 A220 will be delivered during 2018 (eight so far). The A220 agreement has Bombardier covering all ramp up losses until 2020 to a certain maximum level. Airbus at this point predicts this will be enough to cover the initial learning curve costs. 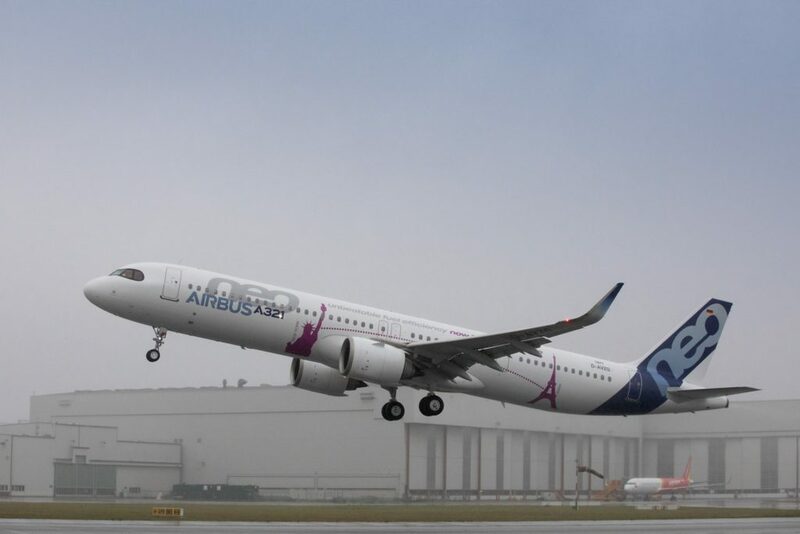 Including the costs of the company around the A220 (the JV CSALP) Airbus sees A220 contributing to the Airbus profits by 2021. With the A220 agreement, Airbus got a top modern aircraft to its portfolio for almost nothing. Deliveries of 600 A320, including 400 neos, is still a challenge. On top of engine delivery problems, there are problems with trimming in new production lines and the complexity of the A321LR’s new fuselage layout (ACF, Airbus Cabin Flex). More than 600 A320 will have to be delivered if the new guidance of 800 aircraft shall be realized. Rate 60 is still expected by mid-2019, as usual dependent on engine deliveries. Both A330ceo and neo deliveries are troublesome. The expected 60+ deliveries assumed around 20 neo, which will now shrink to eight based on what Rolls-Royce can deliver. There is also an A330ceo customer who doesn’t want to take its aircraft. The A350 is the highlight of Airbus Commercial Aircraft for 2018. Deliveries are running smoothly, the learning curve is at or better than expected and the 54 A350-900 and seven -1000 delivered so far is eating less ramp up cash than expected. Add a dispatch reliability of over 99% and a resurgent interest for the A350-1000 (where Airbus has higher margins), and the A350 program is on the way to a future Airbus cash cow. The work on minimizing A380 cash burn at a future rate of six aircraft per year by 2020 to around €100m-€200m is on track. This year’s delivery of 12 A380 and eight for 2019 is under threat as Emirates quarrels with Rolls-Royce over fuel burn for delivered aircraft. Deliveries of 12 A400M so far is according to plan. The concluding of the agreement with the buying nations around a reset of the contract (deliveries, capabilities, penalties) should finish in the next weeks but will take until year end. The program is burning around $1bn in cash this year with hopes to burn less than half this for 2019. I am disappointed that you did not address the crash of the Boeing plane yesterday. As a career Boeing employee and now a Boeing retiree, I care deeply about the company and know that there are legions of us out here that care about the safety of every passenger that flies in our planes every day around the world. Focus on what we care about most, please. I don’t know what you wanted to see Oct. 30. They haven’t found the plane or the black boxes. What else are you looking for? Scratching my head over that one. The A400 is starting to make the KC-46 looks pretty good. The A400 was a complete new design with carbon fibre wing ( a first for Airbus and maybe even ahead of Boeing) with new TP engines of a power rating never before built in the west. It was a special kind of horror and still is. Boeing did the reverse, an existing plane the B767F had to be digitised, not only as 3D cadcam but all the computer tools that Boeing uses for aerodynamic and structural design and testing, a new digital cockpit and refueling station plus a ‘bit of piping’ for refueling along with a contractor designed all new digital probes and drogues. What could go wrong there ? But with the A350 able to go quite smoothly (have to see about the engine still) and the A400 not? Neither the KC-46 which should have been a slam dunk nor the A400 (reminds me of the 787s interations ) are poster child’s other than good examples of how not to do it. Certainly the premise of the A3400 developed under the civil side of airbus was not thought out. Boeing at least is donw to under 200 million per bad news. A billion this year for the A400 and 500 mill next year is a really bad result. When do you quit ? The A400 was mentioned in the article, I wanted to comment on that and give further useful information. Not that anyone else would find useful info from the EPA about airframes or aero engines. For essentially “nothing new” the Pegasus is a rather expensive endeavor for Boeing, isn’t it? .. and isn’t there some point in cost overruns when uncle Sam is back to getting his pockets filched? RR is laying off a bunch of people, you would think that would get the rest of the lazy buggers to amp up their effort and get engine out the door! Firing people always improves things when you have big problems, just ask the stock buyers! Now that is the modern Corporate Spirit! I assume RR tries hard to keep exisitng RR T1000-C customers flying by swapping out T1000-C’s to new built T1000-TEN’s. Also to keep the Boeing 787 line with RR T1000-TEN Aircrafts flowing to waiting customers. With RR locking in MRO into their own shops and a few key customer shops they do not have MRO capacity or parts production capacity for this type of fleet roll-overs. An Engine manufacturer that solves problems by “fixes” is bound to need more “fixes” instead of well engineered analysis with correct material fatigue data, instrumented testing, robust design for manufacturing and validations in ground test, altitude chamber tests and flight tests. PWA contamined RR thru IAE with “fixes”. A220 Deliveries: I understand the A320-NEO deliveries being slowed by the new P&W GTF parts problems, but I don’t understand how they can only get out an A220 about one every two weeks on average after this long of a production learning curve. It possibly could be financial, it could be the seats supplier or it still could be slow delivery of the engines due to the blade problems. Maybe the plane is so revolutionary of a new design with the carbon fiber wing, the Li Alum fuselage and all the cutting edge electronics that it needs to be assembled into a plane in some exotic way. I don’t believe its the engine, the A220 has its own line in Mirabelle. It looks to be a learning curve issue and ramp up of suppliers. Its still the post BBD era and not the dawn yet of the Airbus era that is used to far higher production rates. And better a slow ramp up than a disaster. Factored in my be the sucking sound of the 737 and A320 ramp ups on the industry. Think it is the mixed Aircraft type FAL line in Canada. Once Mobile gets on line it will produce them faster than a typical A320 FAL does. It is an the majority of the “stuff” is not under your direct control. All those major fiddly bits like electronics , controls control, servo, hydraulics, electrical, air condition etc are someone else s.
And each of those someone else dependents on tier 3/4/5 suppliers for bit like bolts and washers and ……. One Tier 4 supplier not delivery a bracket can muck up the whole works. P&W was proud of their tracking system that supposedly (take tht with a grain of salt) tells em when something is going to be late. Hmmm, the one thing it does if it works is get you moving on a fix sooner. But you are still going to be late until you fixed whatever issue there was in that part. Even so, flooding in Thailand took out the hard drive industry that was overly concentrate and all mfgs suffered for 6 months while they got going and alternatives sites cranked up. Japan with the Tesumami had the same issue. Key stuff was concentrated and went down with no alternatives. It won’t take long to find another computer cabinet metal bender (laptops less so) but the core ships, hard drive, boards not so easy. As far as I know the plan is for all 220 destined for the US be build in US. So the Mobile FAL will be mixed as well, no? Delta said it plans to get the majority of its -100s from Mobile, but until it is up and running, the planes with come from Mirabel. Now since only about 25% of the total orders for the A220 are -100s, one would have to think the -300 will definitely come off this FAL as well. The deal done by Airbus on the A220 is shocking. They have a ready made cash cow in 2020, a brand new CF wing to play with and a strategic corner of the market filled, all of this essentially free, gratis and for nothing. the steal of the century in my book. Only issue is when does this start making the A320, the ultimate cash cow, look obsolete. Scott, you allude to improved learning curve on the A350, would it be possible to expand on this please. Perhaps in a piece that looks at it in relation to the B787 which seems to have achieved very strong LC improvements. I tend to think the C Series achievement by Airbus was the steel (pun intended) if not the aluminum win of the industrial age. Along the lines of the Brits giving the Russians the jet engine technology with the Nene back in the 50s. Clearly the A220 will replace the lower end A320 series quickly and its going to be one of the major success stories of the aviation world. Like the 787, its had its gestation issue (other reasons) but the product is simply nailed it and that will pay out in the long term. It needed Boeing or Airbus to do it and Airbus made the smart move. The steal of the jet age, wasn’t the Russians getting the Nene, it was the Americans getting the whittle in1941. Specifically the fridge and lightbulb maker GE. Oh the US got the Nene too, as it was higher power than their own, while Brits had moved on to the early Avon and Sapphire. Sour grapes? Maybe its time to get over it and get one with life? If you want we can got back to the failure of UK and France to invade Germany while they were having their training time in Poland? Did you know the UK fire directions control system were awful? US had good ones. Superior Aircraft like the P-47, P-38, P-51 (which had the engines needed they just would not put the two stage super charger on it) – and made in huge numbers. As valiant the effort was, UK was not going to survive WWII without the US and the ability to produce both high tech weapons (VTF) not to mention mass production of tanks, ships, guns etc. Significant production of aircraft and tanks went to the UK who did not have the ability to mfg in those required numbers. You guys your ticket with Peace in our Time and you pay the piper. While we did not control the arena initially, , the US paid a price in dead, maimed and wounded during that little dust up. Without bankrolling from the US a madman like Hitler things would have gone differently too. The US was the WWII winner … by design. In reality they are booming, the growth target is very agrresive. “Airbus’ adjusted earnings for its commercial aircraft division at the nine-month stage trebled to €2.34 billion, with revenues increasing by 11% to €30.5 billion. They will have to invest billions in the A220 supply chain, assembly to start making profits in a few years. Still, why didn’t Boeing to it? What were the text lines? Boeing is able to hire and fire, almost at will, and can change its production rate at relatively short notice. Airbus, on the other hand, cannot do that, and therefore shows a very steady progression of increased deliveries. In some ways that helps Boeing, but there are downsides in terms of workforce motivation and skill retention. And you see the panic reaction by Boeing in firing people then hiring them back (Charleston back in the 787-9 lull) and now today. Of course they are making so much money they sweep it under the rug. One thing I have learned is that they play the percentages game and not the money end. We cut our rag use by 50% last year. That meant we went from $500 a year in rage to $250. Great success story,l other that we had to switch to paper which has to be disposed of as not a recycle product (rags get cleaned and reused by the rag supplier) not to mention paper simply is more wasteful as it does not do the job like a rag. God save us from corporatism. Looks like Emirates have settled their dispute with RR and will have all their 36 new A380s fitted with the Trent 900. Still, they would love to see the plane evolve and reduce fuel burn, no wonder at the current development of oil prices. My guess is that once RR has solved their durability issues of the Trents, they will really start to push the Ultrafan. Strategically this looks like a great opportunity, as they would be the only engine supplier with a big geared engine for years to come. Maybe the A380 would be the first candidate and the 797 the second one. On the other hand the 787 and A350 would offer a much larger potential. I assume the design of the Ultrafan is more flexible than those of fixed fans, so maybe RR could use basically the same core for the A380, 787 and A350. Really need to get all the engines listed side by side with all specifications. However, the newer engine are also heavier engines. At issue as well is any new engine has to be certified and the costs of that vs the return on a few orders is ???????? A350 sells a 1000 aircraft (not out of reason). That s 2000 engine. A380 stays working at rte 6. In 10 years that is 480 engines. Well, from what I understand the Ultrafan should be lighter than the Trent due to its smaller core and lesser stages, so the wings should be fine. If the Ultrafan works well I’m sure Boeing will also want it for the 787, which would increase the total significantly. The PW GTF is a bit lighter than the Leap but not by a whole lot. Problem is the large intakes required for improved efficiency. This looks to confirm it. What is amazing is you take more of an engines with troubles for 2-3 years than stick with an engine that gave you no problems at all let alone better SFC and maint. As is mentioned in the article, one reason to go with RR may be the development of the Ultrafan. 2025 sounds like RR is making progress, I’d love to know what’s going on there. This promotional video by RR is 3 month old and though they still don’t seem to have closed a deal for any plane, their studies seem to be going well. The speaker states that the switch from titanium to CFRP allows the fan to grow with no weight penalty, which is what I was expecting. They explain they are at their 5th iteration of the gear box and my guess is they are primarily trying to reduce its size and weight. Apparently they are also working on new CMC blades and lean burn combusters. No problems at all [on the GP7200] ?. You must have been reading the EPA again! 1 uncontained engine failures each. There was one that had everyones heads scratching ,wasnt connected to the engines. Think Transworld will enjoy the image in the link below of the 1st engine start up of the 330-800.